Very early in the morning on the first day of the week, the women went to the tomb, bringing the fragrant spices they had prepared. They found the stone rolled away from the tomb, but when they went in, they didn’t find the body of the Lord Jesus. I love the Easter Sunrise Service. I look forward to watching the sun creep up and announcing with other Christian brothers and sisters, “Christ has risen! He has risen indeed! But Easter Sunrise may also be the bane of me. I am not a good sleeper to begin with. Throw in a sunrise service and sleep is impossible. There is really no reason for sleep to evade me the wee hours of this Easter morning. I’m prepared for worship. Two different messages for two different services have been prepared since Friday. We are hosting Easter dinner this year, a first since becoming a pastor. Yet, the table is set and the food ready to pop into the oven at the appropriate time. Even the fruit for the top of the cheesecake is sliced and ready to be beautifully decorated. As I prepared for bed, I was optimistic that I was tired enough to sleep. My main concern was not oversleeping. I dutifully set two alarm clocks to prevent a disaster. My last act of the day after climbing into bed is to pray the Lord’s Prayer. I added a couple sentences to the end last night. A silly request, I know, but it shows how human I am. “Lord God, please help me not to oversleep” as I drifted off to sleep. The first time I looked at the clock, it was 12:59. I’ve been up and down since, trying a variety of things to get back to sleep. No success. As I ran a bath (a go-to way to get back to sleep), a thought came to me. How much sleep did those women who went to the tomb get the night before the first Easter morning? For them, Saturday was Sabbath. By Hebrew law, they were forbidden to do any work on the Sabbath. It would have been a quiet day: time with family and worship. But this Sabbath was different. Jesus had been crucified the day before. Joseph of Arimathea and Nicodemus had arranged for Jesus’ body to be laid in an unused tomb. There hadn’t been time to properly prepare the body. The women had agreed to go back at daybreak on Sunday morning and finish. If I had been one of those women and knew this is what we were going to do, there is no way I would have slept the night before. Despite being emotionally, mentally, physically and spiritually drained, my body would not allowed itself to slow down enough to get a good night’s rest, for fear of oversleeping, especially without a two-alarm backup system. As early as they technically could, the ladies headed to the tomb. They had no idea another shocker awaited them. At daybreak, with dark circles under their eyes, they discovered the unnerving news that Jesus’ body was gone from the tomb. As we prepare to worship and celebrate the risen Christ this am, I pray we can find comfort and peace in knowing that Christ the Lord is risen today! May this story define who we are as people and Christians. Thank you loving us so much that You sent a Savior for our benefit. Amen. If you could choose what you’d want to eat for your last meal on this earth, what would you choose? Most of us won’t get to choose this. But Jesus did. Jesus’ last meal was the night Passover began, the Seder Meal. This is a very holy meal for Jews, with a tremendous amount of symbolism. When the Hebrew people lived in Egypt and were under the oppression of Pharaoh, God sent Moses to release the Hebrews and bring them back to the Promised Land. The Seder Meal recalls what happened the night they began to escape Egypt and reflects the same foods eaten 3,000 years ago. The lamb shank represents the sacrificial lamb slaughtered instead of the oldest son. The bitter horseradish reminds the Hebrew people of the bitterness they endured while slaves. The apple-based charosat represents the bricks and mortar the slaves were forced to make to build Pharaoh great cities. The entire meal is a metaphor for the freedom the Hebrew people experienced once they were no longer slaves. It’s this meal Jesus chooses to make his last. While he could have chosen pizza or chicken strips or prime rib or Mexican, he didn’t. He chose the Seder Meal. In normal Jesus form, there is a twist. Matzah or unleven bread is broken into three pieces at the beginning of the Seder meal. Half of the middle piece is hidden and called the aphikomon. The aphikomon is discovered later in the meal and is the piece of matzah that Jesus used when he said, “Take eat this bread. This is my body broken for you.” Jesus is sharing that it will literally be his flesh, as the third person of the Trinity that represents all the sins of humanity. Just after the meal, the third cup of wine was drunk, known as the cup of redemption. As Jesus instructs the disciples to drink this cup, he says, “This cup is the new covenant in my blood, which I poured out for you.” As he does this, Jesus says that it is HIS blood that will cover all of our sins. In this way, Jesus provided the disciples and us a way to remember and recall the sacrifice he made for us on the cross. It was not until I was in seminary that I discovered how Jesus took the elements of the Seder Meal and redefined them for us as Christians. For Jesus, the actual food of last meal of his life was not nearly as important as using symbols from this meal to help us more clearly understand just who he was. Tonight, we’ll share a Seder Meal at Midland. I believe it is terribly important for Christians to understand the context from which our Sacrament of Communion is derived. Why? If Jesus felt it was so terribly important to make this the last meal of his life, then we can see how important it is for us to celebrate Communion together as a Christian family. I love good food. But this meal reminds me that Jesus’ sacrifice was very intentional and deliberate. May we all celebrate Holy Communion today and remember just what Jesus wants us to see. Always the teacher, thank you Lord Jesus, for taking a simple but important meal and providing this as a way for us to see what your life represents. Help us to see through the symbolism of the Last Supper just why you came to this earth. May we see how you gave us this gift as a way for us to always celebrate your presence with us. Amen. Jesus’ tolerance for things changed Holy Week. He no longer accepted folks taking advantage of this Father’s house. Add to this, each family also needed to make a sacrifice of a dove. According to Hebrew law, the dove was to be unblemished. The only place to get official, certified unblemished doves was at the market stalls at the Temple. We can only imagine how vendors took advantage of folks during Passover. Jesus often taught on the Temple steps while in Jerusalem. When I was there several years ago, it was moving to sit on the same steps where he often taught. Now, imagine Jesus being there and watching all these vendors taking advantage of ordinary Jewish folks … and the Jewish religious leaders simply turned their heads and ignored it. Maybe they were even getting a cut on the deal? Who knows. What we do know is that enough was enough for Jesus. Jesus came to make God completely accessible for all people. As he nears his death, he only sees people taking advantage of those who really can’t afford special taxes and hefted-up prices. Can we blame him for running the vendors out of town? So often, we want grace for ourselves and judgment for others. We want easy rules for us and hoops to jump through for others. Help us see when we are not fully loving as Jesus modeled for us. “For life is more than food, and the body more than clothes. Consider the ravens: They do not sow or reap, they have no storeroom or barn; yet God feeds them. And how much more valuable you are than birds! Who of you by worrying can add a single hour to your life? Anyone tired of winter? Aren’t we all? We’ve had this running conversation at our house as to whether the robins have returned. Last week, Rick professed he saw a robin on Thursday. On Friday, we went for a “looking-for-robins” walk. I didn’t see one, but Rick is confident he heard one. 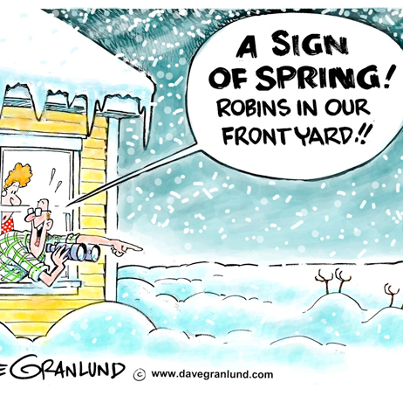 I discovered this cartoon, posted it on Facebook and now we are hearing who has and has not seen a robin yet this spring. Rick loves hearing when others have seen robins also. It is Holy Week. For Jesus, the days and hours were very limited. A careful reading of the events from the last days of his life demonstrate poignancy to his ministry. There is no messing around, here folks. While the verses from Luke I’ve posted above aren’t from the last week of Jesus’ life, they definitely describe his view on life. Don’t sweat the small stuff. There is little advantage to worrying. We are all grasping for any sign of spring this year, especially since it has been so slow in arriving. But Jesus didn’t come for the birds. He came for you. Look today for the indications that you are worth dying for: the unexpected phone call; the well-time hug; the kind word anonymously shared. Worrying didn’t add any time to Jesus’ life. Fortunately for us, he knows our individual worth maybe even more so than we do ourselves. Let us trust in Him more than we trust in the birds. We look for symbols and signs around us rather than looking to You, the source of all goodness and blessing. Thank you for predetermining that we were someone worth dying for. Amen. PS – I apologize for missing several devotions during Lent. Maybe I’ll be more inspired after Easter! After I returned from living overseas for a year, I realized I didn’t have a toaster. I think I threw the previous one away. My sister had just gotten a new toaster, so she gave me her old toaster. If I recall, she received my newly inherited toaster for a wedding present. She said that it would get my by until I got a new toaster. It’s a very simple toaster. Nothing fancy about it. Only room for two pieces of bread. No wide slots. One adjustment for light and dark. But I have used this toaster many days a week for almost the last 14 years. Yup, 14 years later and the tie-me-over toaster is still in use. Maybe I keep it because there is a place in the cupboard right next to the stove where it fits perfectly. (I’m not crazy about lots of things on the counter.) While there have been times I have wished for a wide-slot toaster so bagels would not get stuck, apparently there have been other things I have wished for even more because a new toaster has never even made a shopping list. As I get a little older, my desire to accumulate things has changed. I have decided that simple is good enough. I try to be mindful and really only purchase things that I a) really need; b) really love or c) is replacing something else. Of course, clothing and shoes do not always fit one of those three categories. If I were totally honest, I occasionally still buy things when the price is just too good to pass up or as a splurge treat. We live in a disposable society. Rarely, do things actually get fixed. It is often more cost-effective just to purchase new. Or when an old appliance or gadget no longer fits the current color scheme of a room, we feel we must buy new, rather than finding a way to accommodate the no longer color appropriate item. There does seem to be a slight trend to repurposing things these days. I love seeing these things Unfortunately, I do not have this creative gene. I’ve been trying to fast from buying things unless I really need it. Not only has it allowed for a little more cash in the check book, I spend less time shopping, whether on-line or in-store. Yes, I have been shopping, including running some errands yesterday. But it has been refreshing not to put so much energy into shopping. What this has reminded me is that sometimes little shifts in behavior, energy and thought process make a difference in how I view my life. Sometimes, we expect that we have to make huge changes for life to be different. I am becoming more convinced that slight shifts and changes really are important. Not only are they more realistic, they can have more impact over the long haul. Someday, I will buy a new toaster. There is a good chance I’ll go grocery shopping yet today. What I am discovering is that it really is wonderful to put less thought into things that pull me away from where I want to be. Simple really is good. How easily our lives get cluttered with things. Simply living with whatever he could carry, Jesus was anything but high-needs. May we choose to fast from consumerism and instead find solace and content within your loving arms. Amen. Near the top of my pet peeve list: misplacing something. Recently, Rick and I spent an overnight at my Mom’s house. I had taken along my laptop and used it multiple times. Once home, I realized that I had misplaced a flash drive. This is a little stick I put into a computer USB port to store information. Ridiculously convenient, I use them all the time. Now, the flash drive I use most regularly was missing. After going through the things I had taken to Augusta, I did not panic but called my sister. It had to be in plain sight at my Mom’s house. She looked with no success. I suggested a few other places. Still no flash drive. I was getting by without it until I realized all the bookwork for our personal finances was on this flash drive. Recently, Rick asked how I was coming on pulling together the information for our taxes. I shared that I had a few more months of bookwork to complete before actually doing our taxes. What I didn’t share is that I could not find the only files with the information for the months I had completed. How many times could I look through my bags and hope that little flash drive would appear? I contemplated driving the nearly six hours round trip to look for the flash drive myself. It would be less time than recreating the personal finance files, let alone the hundreds of other files. I was in a meeting yesterday when my sister sent me a text message. She had found the flash drive! It was safety stuck into my Dad’s computer CPU tower. I had put it in there to print something! With the help of priority mail, I should have it today or tomorrow. Writing about this in a blog is my way of calling some of my friends and saying, “Rejoice with me! I have found my lost flash drive!” The parable of the lost coin is sandwiched between two other parables Jesus told: the parable of the lost sheep and the parable of the lost son. Through three different vignettes, Jesus uses real life situations of losing a sheep, misplacing a coin or a child leaving the home to help us realize that no matter what we have done to distance ourselves from God, God yearns for us to come back. The excitement I felt for finding my lost flash drive is just a smidgen of the excitement God experiences when we pray for forgiveness, choose to worship regularly, allow ourselves to be God’s hands and feet. Any time we choose to do something that terribly pleases God, God wants to through a feast and celebrate! Sometimes we get tired of being used by God. Other times, we think it is someone else’s “job.” Or we simply fill our lives with secular distractions. We forget God’s rejoicing when we make a godly choice. 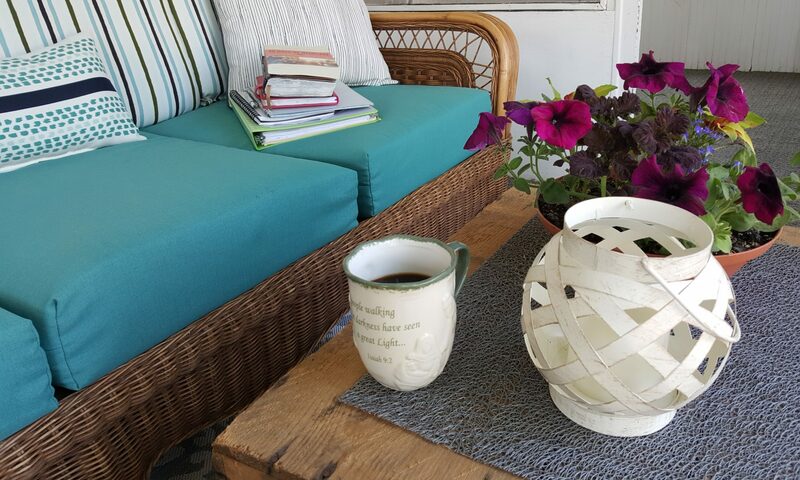 Too often I put energy into finding the most recent misplaced item in my life rather than putting energy into making myself reconnected with God. Lent is a time to focus on that recommitment and connection with God. I pray we are finding opportunities to do this during Lent. Thanks for being patient with us, for seeking us even when we don’t want to be found. And you never bore of celebrating when we please you. May we find time this day to reconnect with you in a way that puts a smile on yours or someone else’s face. Amen. As Jesus walked along, he saw a man who was blind from birth. After Jesus said this, he spit on the ground, made mud with the saliva, and smeared the mud on the man’s eyes. 7 Jesus said to him, “Go, wash in the pool of Siloam” (this word means sent). So the man went away and washed. When he returned, he could see. I am a bath person. Growing up in an old farmhouse, this was our only option. Going to college and having a regular shower was a treat! While I enjoy the quickness of a shower, at the end of the day, I love soaking in a hot bath. During seminary, this was one of my favorite places to read. A few years ago, I convinced Rick to finally put in the deep bathtub with jets that I longed for. The bathroom previously had a complete shower surround. As he was cutting the surround into pieces to get it out of the bathroom, he questioned if this was really what I wanted. The neighbors must have thought we were crazy when pieces of the surround came shooting out our bedroom window. I view this bathtub as a cheap therapy session. I love getting my entire body surrounded by water with some bubbles. In the winter, I often take a bath before bed as one way to help me sleep better. Based on last month’s water bill, it appears I have been taking a higher than average rate of baths. After sleeping for a couple hours last night, I woke up and was not able to get back to sleep. Since I had not had a bath before going to bed, I decided to try this trick. Earlier this week, I encouraged people to find a place for 30 minutes just to be with God. Last night, the reading material stayed on the countertop. I never cracked the book open. I just wanted to be with God in the warmth of the bath tub. Honestly, no profound thoughts came my way. I replayed over the events of the last few days in my mind. I thought about what lies ahead. I recalled that I had not completed a blog for the day. And then, I just thought about nothing except my Creator, Redeemer and Sustainer for the last half of the hour. I am not sure that anything really came out of this time except the thought of capturing this experience here. While visiting a pool one day, Jesus healed the man’s sight. There was much controversy over Jesus’ healing. The simple truth is after Jesus smeared mud on his eyes, he went to the pool, washed and he could see. Sometimes we need to put ourselves into position and places we can “wash” ourselves and see the One, True Son of God who offers us a way to see through the things of this world that may blind us. Too often we choose not to see the things that God longs for us to see because we have been too busy to see what laid before us. I know that just 30 minutes in a bathtub will not open my eyes to everything God desires for me to see. But it is a place to start. How I appreciate the moments when I do slow down and seek you. Help me see you today in my day. Give me eyes to see the things you so long for me to see. Amen. The living, the living can thank you, as I do today. Today was my friend Carlene’s celebration of life. At the worship service, it was my privilege to witness to her life and share some things that made Carlene special to other folks and me. Living today: Today is a gift. Embrace it with joy and anticipation … realize the possibilities. It beckons you towards your destination in life. Be at peace – you are exactly where you are meant to be at this moment. God has carefully chosen the people, events, joys and challenges on your path today. The things you will encounter are stepping stones of what is to come. Make the most of today. Focus on “the present”—you will see and appreciate things you might otherwise miss. Follow your heart – search to find your purpose in life and you will find meaning and happiness. Use your talents, do your best, contribute. Make a difference, because you can. Be passionate about your journey – sing, dance, laugh and love as you go. Give praise and allow time for prayer. The promise of tomorrow begins with the endeavors of today. Do not let the fast-forward pace of the world deprive you from savoring “the now.” Seek things that fill you with love and bring you joy. Have faith, it fosters hope – it makes the difference. Believe, with God all things are possible. Live well – live today, for it is a gift. In the last few months, I have been reminded several times that today is a gift; every day is a gift. Too often we let things from yesterday cloud our opinions and prevent us from fully loving people. And then there are the days we do not fully appreciate and let slip by without considering them a gift. Today is a gift. Treat it well. I pray Bonnie’s words help us live today with an appropriate perspective. Thank you for today, Lord God. Thank you for being present with me and providing just what I needed for today. Inspire me to make the most of today. Amen. When daybreak arrived, Jesus went to a deserted place. The crowds were looking for him. Once Jesus established Capernaum and the Sea of Galilee as his ministry home base, it didn’t take long for the crowds to swarm him. Despite no Twitter feed, Facebook updates or text-messaging sightings, even when Jesus tried to have time alone, he was found. I think it was more than paparazzi following him around. While there were lots of inquisitive folks who were skeptical, I also think there were a bunch of folks who really wanted to see if they could be healed, experience a new power in their lives or find peace and comfort in something. Spending time with other folks can be very draining. Personally, these days it takes more energy for me to be at the top of my game when present with others. How did Jesus deal with thousands of people clamoring for his attention and energy? He spent time with his Father, before and after exhausting times. It’s daybreak. The sun is just beginning to peak up over the horizon. Where is Jesus? In a very quiet place, all by himself, only in the presence of the Father. Quite often after one of those exhausting ministry days, we hear him sending the disciples ahead so he can have some quiet moments by himself before he performs the next miracle. When was the last time you spent 30 quiet minutes with the Lord? I mean, no TV, no music, no earphones, no nothing. Just you and God. Unfortunately, it’s been way too long for me. When I received a call into ministry, I often wondered how many times previously God had tried to get my attention and tell me something. I was too busy to hear the Lord’s voice in my life. I really wanted to avoid doing this in the future. Thirteen years later and I know I’ve missed God’s voice. I know I’ve let other noises drown out the most important voice in my life. This week, I’m going to find 30 minutes just to be with God. Where is a place that you feel close to God? Go there this week, all by yourself and spent time with God. We’re supposed to get a bunch of snow in the next 36 hours. Could you take 30 minutes away and just be with God while it snows and we wait to dig out? Or maybe after the snow, you can go to that special place and just be with God? I cannot promise something profound will happen in those 30 minutes. Most likely, it won’t. Even if you do not really hear anything back, the exercise is not wasted. It may take more than one 30 minute block of time to decompress and hear God. How often we spend 30 minutes in front of the TV, checking Facebook or surfing the internet. In this season of Lent, let us chose to spend 30 uninterrupted minutes with God so we can just breathe. Lord Jesus, if you needed time away to be with the Father, how much more we need this time with you. What makes us think we will hear your voice without some quiet time with you? Inspire us to spend 30 minutes with you this week. Let us have no expectations about this time other than just to be with you. Amen. Jesus went down to the city of Capernaum in Galilee and taught the people each Sabbath. Three years. This is the time many biblical scholars believe was the length of Jesus’ ministry. Think back to March 2010. How has your life changed? We’ve added a couple grandchildren added to our family and my dad has passed away. We’ve celebrated several Holy Week and Easter celebrations and Advent and Christmas seasons. Three years from now it will be March 2016. Will my life be very much the same or will it be considerably different? It is impossible to know. Consider where you were spiritually three years ago. Has this area of your life changed? I have learned there is far more to the Christian life than getting it right. There is living it right. While I can learn more about the Bible, the gospel and what I perceive as God’s truth, living means applying information in a world filled with disappointment, doubt, suffering, idolatry and forgiveness. I love learning. I often miss the intellectual stimulation from seminary. But I do not grow mature in my Christian life simply by reading books, skimming scripture, listening to sermons and going to church. We grow by taking the stuff from our ordinary, everyday lives and integrating it into our understanding of our faith. We discover what faith means for us personally when we take our spouses and families, our parents and siblings, our children, our friends, our co-workers, our dreams and fantasies, our hopes and dreams and lay them before our Lord and Savior. We can have lots of “information” accumulated about God but unless we discover how to “apply” it to everyday life, it’s simply information. The person with the most information doesn’t have a competitive advantage in the end. Those who somehow begin to develop a life of holy living on a daily basis makes God smile. This is not a life only reserved for nuns and monks and popes. I think God deeply desires for us to each move a little closer to God in our daily living; something very accessible to all of us. Where would I like to be spiritually in three years? A little closer to this holy living. More able to take daily life situations and contemplate how they fit into my understanding of grace and mercy. I pray that I have a deeper understanding of how events from the Old Testament influence and connect to the life and ministry of Jesus Christ. But until I take those events and connect them to my life, it is no more than a bunch of information. Three years can zip by. May we see that daily, we choose to move closer to you or further away from you. Flat-line spiritual living really doesn’t happen. May we choose to seek how to live more holy daily.